The rhythmic, staccato sound of the word "Timbuktu" has inspired stories, travel diaries, novels, poems, and now, an exhibition on nomadism. Any trip will go on to take the form of a story. One travels to be able to tell the tale. The Scotch explorer Alexander Gordon Laing was the first European to arrive in Timbuktu. His stay there was brief, between the 18th of August and the 24th of September, 1826. But he died two days later, assassinated. He didn't have time to convert his travel into narrative. The French traveler René-Auguste Caillié had different luck. He arrived in Timbuktu on the 20th of April of 1828. He spent two weeks in the mysterious city, then crossed the Sahara, passed through Morocco and returned to France. The three volumes that covered his travels were published soon afterward. I like to think of the nomad as a traveler through cultures and geographies. As symptom of a world in crisis, as a consequence of economic, political and social cycles. At the core of nomadism are dispersion and movement, and these are the basic principles on which the installation by Esteban Alvarez and Tamara Stuby is based. A nomadic culture modifies a sedentary one, not so much for the things -he who moves cannot take along too much baggage- but because of the stories and customs, that are taken along always, everywhere. Esteban Alvarez and Tamara Stuby evoke nomadic ideas of travel and dispersion from various perspectives. The work initially hinges upon the contrast between concepts of movement and stillness. What travels is the mind, in a context of waiting, ennui, routine in front of the television screen. Argentina has a long tradition of diaspora. During the 19th Century, many of those whom history has revered because of their contributions to the country´s independence, its constitution or consolidation, were obliged to spend a large part of their lives in exile, or to die on foreign soil. The partisan conception of Argentine politics was always accompanied by the expulsion, annihilation or disappearance of rivals. In the 20th Century, the addition of a strong wave of European immigration that had begun during the latter third of the 19th Century and extended until the middle of the 20th with the second world war, resulted in a more complex situation. Along with the phenomena of immigration came a wave of illustrious exiles, due to numerous and prolonged dictatorships, as well as periods of economic crisis. In the Argentina of 2002, her society's imagination is fixed on exile as a response to the extreme political crisis and complete economic debacle. From this perspective, combined with the fictional idea of the trip as movement and its relation to a curatorial proposal, the installation by Alvarez/Stuby can be seen as a critical vision of this past and present. Additional levels of complexity arise from this mix of hyper-reality and hyper-dream. 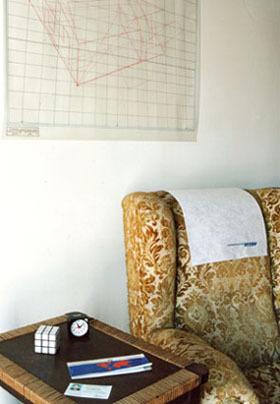 On the table can be found an airline ticket, an overseas work permit, a travel clock and a Rubik's cube. Seen up close, each reveals some peculiarity. 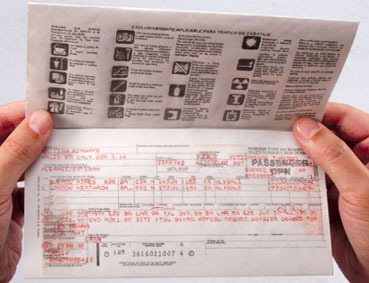 The airline ticket is drawn by hand: it is a hand-crafted imitation. 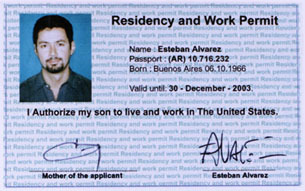 The overseas work permit is emitted and signed by the artist's mother. 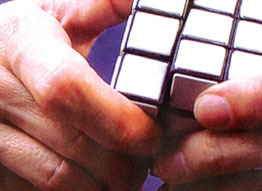 The Rubik's cube, instead of being comprised of different colors on each side, is all white, converting it into a challenge that is either infinitely difficult or ridiculously simple. The clock doesn't seem strange at all. Nonetheless, it isn't the only one in the installation. There is another, on the wall. And between them there are several hours of difference: in the same way that there is play within the same physical space -like in airports, like on international news broadcasts- between the hour on two continents. On the headrest of each armchair, a cloth protector embroidered with the name of the artist explicitly makes reference to airline seats. A trip in an airplane is a voyage in time, that violates time zones and generates maladjustments and paradoxes, like adding or taking away hours of our lives in a single day. 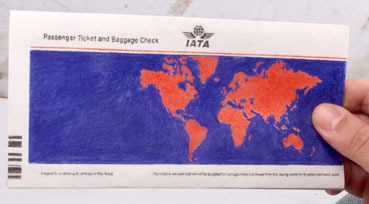 The temporal dimension of the idea of travel comes from these airline references. But the spatial, geographic and territorial dimensions are also evoked, by the drawings that hang on the walls, by way of decoration. 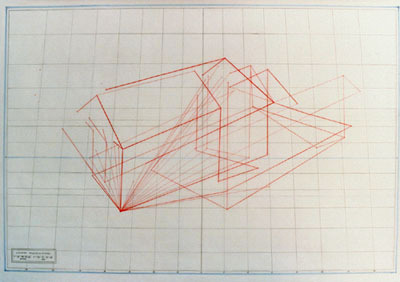 They are house plans and projections drawn over the grid of coordinates from a world map. In this way, the projected lines relate to a point of disappearance on the horizon and to paths of escape, that wind up literally transforming the dream home into a world. A nomadic concept -dispersion and movement in space- intersects with the idea of the cosmopolitan- all cities being one city; all citizens in one, all spaces in one-. 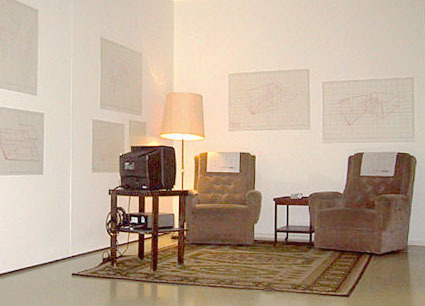 Within the installation's atmosphere lies an enigma, like in mystery tales: the presence of the Rubik's cube. In principle, this cube, had it been found on a medieval geographer's table, could have been inferred to be a projection of the world, a variant of that flat earth that existed in the pre-Renaissance imagination. To unite this cube with the other elements related to travel generates the same effect as a piece of erroneous data, a cog left over, a false lead. Or, like the effect of reading that allows for the tension between seeing either the image of two profiles or one vase, it may speak of an enigma. In the construction of a fiction -above all of a fiction reduced to a minimal repertoire, as in this case- every element must be taken as a clue. In this sense, the strangest element is, without a doubt, the Rubik's cube. On the television that forms part of the installation, we see how the artist's hands (Alvarez and Stuby) manipulate the cube, with the purported intent of discovering its solution. The combination of rotating movements that govern the logic of the Rubik's cube wind up to be invalid in the Alvarez-Stuby version, because all the faces are chromatically uniform. But it is obvious that here, it's not about an enigma, but a loop of logic, a problem with no solution, an exitless maze, a game with no rules. * Editor and art critic (Argentina, 1961). Visual arts editor for Pagina/12 (major daily newspaper in Buenos Aires). Executive Director of Adriana Hidalgo publishers. Member of the Board of Directors of the Antorchas Foundation.